Manchester City vs Tottenham predictions, betting tips and preview for the Champions League quarter final second leg on Wednesday 17th April. Can City overturn the first leg deficit and make it through to the last four? Son’s goal at the Tottenham Hostpur Stadium gave Spurs a vital first leg lead. Pep Guardiola will be wary that his side do not have an away goal going into the second leg. Harry Kane is out injured but Dele Alli should be back despite a broken wrist. City will be hoping to avoid going out of the Champions League to English opposition at this stage for the second season in succession, after Liverpool beat them this time last year. That tie was much further out of their reach than this one is though and it would be no surprise to see Guardiola’s men turn this one on it’s head. City kept pace at the top of the Premier League with Liverpool thanks to a 3-1 win over Crystal Palace at the weekend, despite Palace threatening a late comeback. Kevin De Bruyne’s performance was a shining light and he’ll be expected to start along with two goal Raheem Sterling, who took his tally to 20 goals for the season. Tottenham will be without Harry Kane for the match, and the rest of the season, after getting injured in the first leg and that is a massive blow not only to their Champions League run, but to their top four aspirations as well. Heung-Min Son will start the match up front after being rested for the win against Huddersfield at the weekend, and Lucas Moura could play following his hat-trick. Dele Alli could come back into the line-up after suffering a broken wrist in the first leg. Spurs have the vital first leg lead and could sneak an away goal here, so the first of our Manchester City vs Tottenham predictions is for City to win and both teams to score. In the last round, Manchester City blew Schalke away in the second leg, winning the match 7-0 to complete a 10-2 aggregate win. This scoreline will be nothing like that but we could get more goals, especially if City score early like they so often do. Both teams to score looks a great bet at around the 4/5 mark and it’s a must for your BTTS accumulator this week. 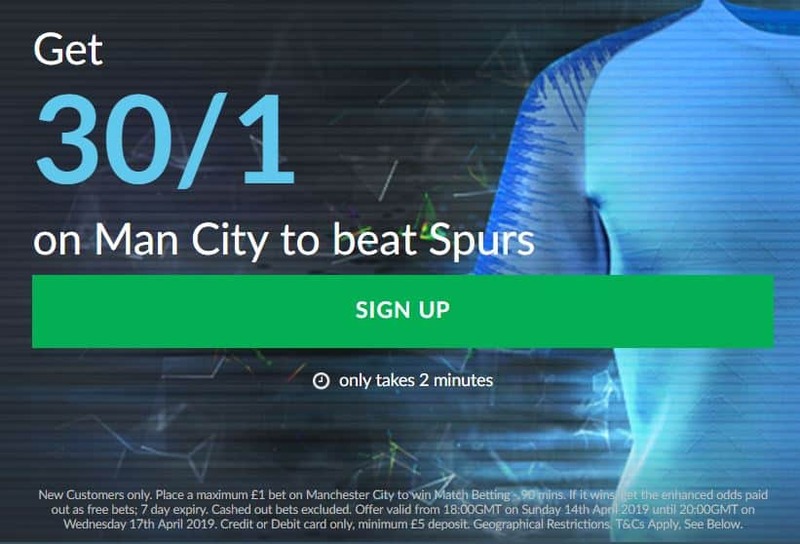 For our next Manchester City vs Tottenham betting tip, we’re going into the anytime goalscorer odds and as usual with Man City matches, we have to try and predict who will start the match before picking a selection. Raheem Sterling is almost certain to play on one wing and could start on the left, with Bernardo Silva coming back in after a rest against Crystal Palace, and hopefully Kevin De Bruyne will keep his place from the start. He’s going to be the selection for our anytime scorer tip here. The Belgian has had an injury hit season but has got fit at just the right time for the run-in. At almost 3/1 with Ladbrokes, we cannot ignore the price for Kevin De Bruyne sp he’s the next of our betting tips, just ensure he is in the starting line-up before placing your bet and use the Ladbrokes £30 sign-up offer. Spurs have the advantage going into this second leg, but without Harry Kane Mauricio Pochettino will know the Spurs task it a lot tougher. Despite having a goal lead to cling onto, this could be gone in the blink of an eye against this Manchester City side, and if that happens, Spurs then have to either hold on for extra-time or push for an away goal. All of the eventualities for this game lead us to believe it will be a really exciting match and even though Spurs could get an away goal, the last of our Man City vs Tottenham predictions is still for Manchester City to win 3-1 and qualify for the semi-finals of this season’s Champions League. 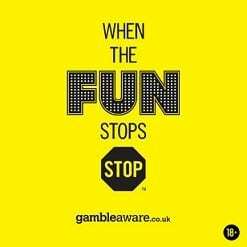 Bet £1 on Man City to beat Tottenham with a new Bet Victor account and win £30 if they do so.